Diaphragm Pumps Ltd. Are the UK's Largest Official Suppliers of Garlock® Diaphragms and Gylon® Diaphragms. GARLOCK® ONE-UP® Pump Diaphragms are durable and versatile. Containing high performance PTFE GORE® sheet on the wetted side, they last significantly longer than other conventional PTFE diaphragms. 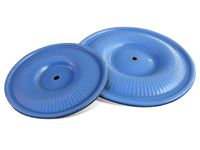 These diaphragms provide a dramatic improvement in service life and are considerably stronger, with greater flex life. 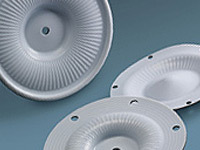 Excellent chemical resistance makes GARLOCK® ONE-UP® Pump Diaphragms extremely versatile. They are suitable for use with most chemicals and in elevated temperatures and pressures, and are ideally suited for general-service pumps that are used for a variety of pumping tasks. Satisfaction guaranteed, or purchase price will be refunded. Chemical Resistance: Resistance to all media in the 0-14ph range except molten alkali metals and elemental fluorine. For years the industrial ONE-UP® pump diaphragm has been the first choice for the most demanding industrial applications. We are now introducing the new GYLON® ONE-UP® for the most demanding sanitary applications. Made using our exclusive GYLON® PTFE Diaphragm material and a proprietary EPDM rubber backing, this product is made with the same patented rib construction of our standard industrial ONE-UP®. This FDA compliant diaphragm will have the same chemical resistance and long life as the industrial ONE-UP®, however this diaphragm can be used in food and regulated applications. The GYLON® ONE-UP® will outperform your current diaphragm; however because it is not as abrasive resistant as the industrial ONE-UP®, we are recommending it for non-abrasive service only. This product has the same Satisfaction Guarantee that the standard Industrial ONE-UP® has. This is a money back guarantee on your initial order if you are not completely satisfied with the performance of the diaphragm. Available in all of the sizes and pump offerings that the industrial ONE-UP® is made: ALMATEC®, ARO, DEPA, BLAGDON, FLOTRONIC, GRACO, UNITEC®, VERDERAIR®, VERSAMATIC, WARREN RUPP, WILDEN® AND YAMADA®. Made in a one-piece design, this diaphragm is simple to install. Whether it incorporates bolt holes or a perimeter sealing bead, it fits easily into the pump housing without the difficulties associated with installing two-piece diaphragm sets.